You can use a USB Drive for the installation of Ubuntu. The most popular software used to serve the purpose is UNetbootin although many others exist e.g, Pendrivelinux. 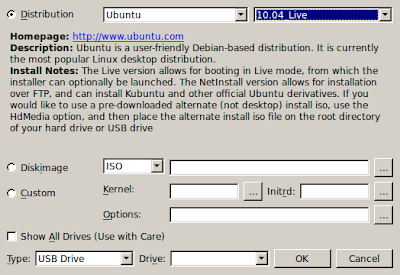 If you are using Windows for creating Ubuntu Live USB, download the Windows version of UNetbootin. If using Linux, obviously, you need to download the Linux version. UNetbootin has got the ability to automatically download the popular Linux distro ISOs itself and then use them to burn the USB. 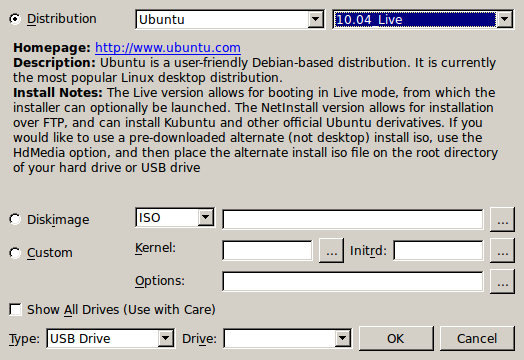 Choose the "Distribution" option and choose "Ubuntu" and the version you intend to download. "10.04_Live" in this case. If you've already downloaded the ISO, you need to choose the "Diskimage" option in UNetbootin and then give path to your downloaded file. Warning: If you don't feel confident, don't enable the "Show All Drives (Use with Care)" or you might over write one of your partitions. You need to be precisely accurate with that thing. Once completed, it would give you an option to reboot. Reboot and select USB Drive as the first boot device and you'll be ready to install Ubuntu. Recommended: It is recommended to check the MD5SUM of your downloaded image. It would check the image against any possible defects and believe me, it would save you lots of troubles later.